The immune system is crucial for our survival. It protects us from pathogens such as bacteria and viruses. Immunology is the study of the immune system in health and disease. It is the reason why we recover from a cold but also why we suffer from allergies, have diseases such as diabetes and why we reject tissue transplants. Immunology is the basis of many health issues in our society. These include vaccination, tissue transplantation, cancer, allergies and autoimmunity. The Department is a leader in immunology teaching and research into fundamental and clinical immunology. The Department of Immunology and Pathology is a leader in immunology teaching and teaches into a range of degrees including the Bachelor of Science, Bachelor of Biomedical Science and MBBS medical degree. We offer an extensive range of immunology units across level 2 and level 3 which are designed and delivered by staff with extensive education and research experience. With a mix of theoretical and practical based units, we provide a comprehensive coverage of immunology; equipping students with knowledge as well as analytical and scientific skills for a career in the biomedical sciences or other directions students may wish to take. Choosing to study immunology provides a foundation to understanding many aspects of human disease and a field filled with new and exciting discoveries and applications . To celebrate our student’s achievements student prizes for each year level are awarded each year. This is our foundation unit and introduces students to the immune system which has evolved to protect us from microbial pathogens. It involves both theory and practical based sessions on topics such as structure and development of the immune system, the generation of immune responses, major effector mechanisms involved in pathogen clearance, basic structure and function of viruses and bacteria and immunological techniques used in assaying immune responses to micro-organisms. For more information on this unit please refer to the Undergraduate Handbook. This unit provides students the opportunity to examine in more detail the role and diversity of immunological based issues. A selection of immune based disease and health states are examined in the contexts of exploring and understanding the role that the immune system has in each situation but also the impact and implications of these on a range of criteria such as social, economic and ethical to name a few. Students have the opportunity to develop key research, writing and oral skills through defined assignments that will broaden their view of immunology but also aid in their general studies. This theory based unit examines in depth important features of development and function of the immune system in health and disease. Areas covered include development of the innate and adaptive immune system, antigen processing and presentation, maturation of the immune response, self tolerance and regulation. Students will learn the principles of advanced techniques in immunology including the relevance of genetic engineering and will acquire skills in reviewing the literature and assignment preparation. For more information on this unit please refer to the Undergraduate Handbook . 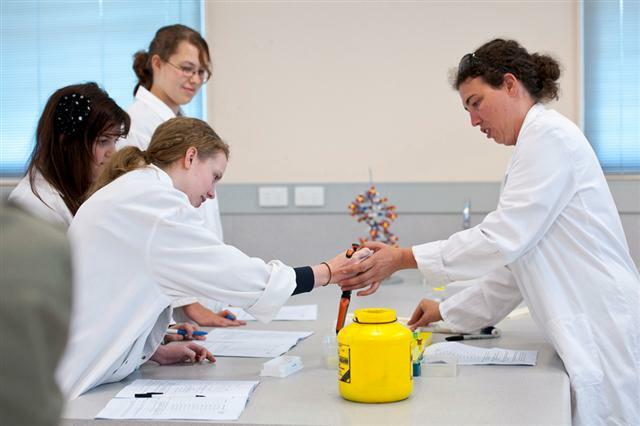 This unit aims to develop students' practical skills and knowledge of laboratory immunology. The course is laboratory based with tutorials to ensure a thorough theoretical understanding of techniques. Students will learn about antibody production, purification and research immunology techniques. 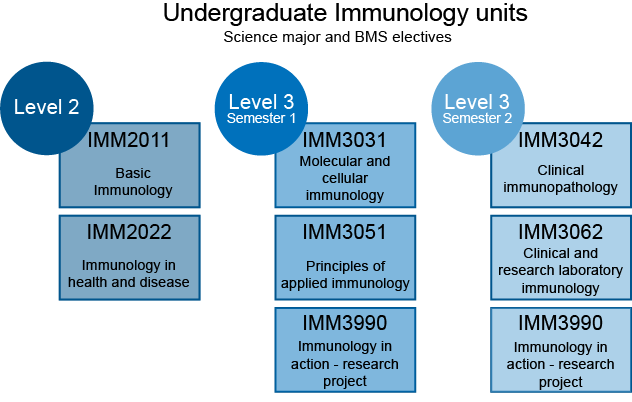 This unit gives students a firm understanding of techniques relevant to immunology and many other scientific disciplines. This theory based unit examines regulation of the immune response and how this knowledge can be applied to improve disease treatment. Host-pathogen interactions are considered together with new strategies for vaccines. In addition, diseases of the immune system are examined including immunodeficiency, autoimmune and allergic diseases. As well students will study the role of the immune system in tissue transplantation and tumor eradication. This unit examines advanced techniques used in clinical and research immunology laboratories. These include assays for lymphocyte proliferation, cytokines, cell-mediated cytotoxicity, detection of antigen/antibody reaction by immunoblotting an. The unit is laboratory based with tutorials to ensure a thorough theoretical understanding of techniques. This unit provides high achieving students the opportunity to join a research laboratory and conduct a research project within the Department of Immunology. On completion of this unit, students will have acquired skills in searching relevant databases, reviewing scientific literature in Immunology and preparing and presenting oral and written reports. They will be involved in the planning, conducting and analysis of experiments designed to address defined scientific questions. Students undertaking this unit will have typically completed some level 3 Immunology based units and this unit does have an academic prerequisite. The Jared Purton Prize is awarded to the top level 2 undergraduate Bachelor of Science (BSc) or Biomedical Science (BMS) student undertaking IMM2011 and IMM2022. The Nairn Prize in Immunology is named after the Department's founding chairman, Professor Richard Nairn, and given to the top Immunology Honours student completing his or her project at Monash and coordinated through the Department of Immunology and Pathology. In addition to immunology the Department contributes to undergraduate teaching in human pathology and cell biology. Together with immunology these units provide students with a strong background in biological and biomedical sciences. This unit introduces students to basic pathological processes, with particular reference to tissue injury and cell death, inflammation, haematopathology, disorders of immunity, disorders of cell growth, neoplasia and pathology of infectious diseases. Mechanisms for pathological processes are reviewed together with how these processes cause disease by overcoming normal regulatory controls. Principles are illustrated by reference to specific diseases. This approach provides students with an understanding of terminologies applicable to pathology and an appreciation of the causes and natural progress of human diseases. This unit adopts a systematic approach to the study of pathology. Organ systems will be addressed highlighting the important diseases along with their specific outcomes in each. Specific diseases to be studied include: ischaemic heart disease, diabetes, obesity, stroke and neurotrauma, neurodegenerative diseases, multiple sclerosis, genetic and acquired blood disorders, leukaemia, carcinomas of the breast and diseases of the kidney. The aetiology, clinical presentation, treatment and course of the diseases will be outlined. Particular emphasis will be placed on molecular and genetic aspects of disease pathogenesis. Laboratory investigations will be presented to provide an integrated approach to the diagnosis of specific diseases. HUP3990 is a mini-honours which can be undertaken during Semester I, Semester II or during the Summer Semester. We have a wide range of research projects to select from. The projects are conducted at the various Departments of the Central Clinical School located at The Alfred Hospital. HUP3390 gives the students an opportunity to conduct real medical research in the host laboratory. This is beneficial in gaining laboratory and work experience skills in a hospital environment, conducting in depth research into a specific human disease, and getting a feel for a career in medical research and related areas. Honours level study can also be conducted in Immunology and Human Pathology.